If you’re looking for a one-of-a-kind rare species then you want the Flame Thrower Palm. The Flame Thrower Palm is one of the most beautiful palms in the world. The botanical name of the Flame Thrower palm is Chambeyronia macrocarpa and comes from New Caledonia. The luscious island of New Caledonia is east of Australia and north of New Zealand. On this island you will find extraordinary primitive plants including the Flamethrower which dates back to the Mesozoic Era, when dinosaurs roamed the planet. The Flame Thrower is considered cold hardy. They can resist temperatures down to 25 degrees F. The Flame Thrower Palm is a large, robust, pinnate palm with broad leaflets. Their leaves are deep shade of green recurving and drastically arching leaves. The Flame Thrower Palm is very easy to care after. These exotic and rare cold hardy palms thrive in a well-drained, moist climate with full sun to light shade. It is also know as the blushing Palm, Watermelon Palm, Red Feather Palm, and Red Leaf Palm. It also has one new emerged leaf that will be red to maroon in color but will fade after 2 weeks. This rare palm tree is a slow growing palm tree with a maximum average height of about 15-20 ft. This palm tree will have any person in awe with its beauty. The Flame Thrower Palm is a wonderful specimen to have whether it is in your home, office, or landscape. 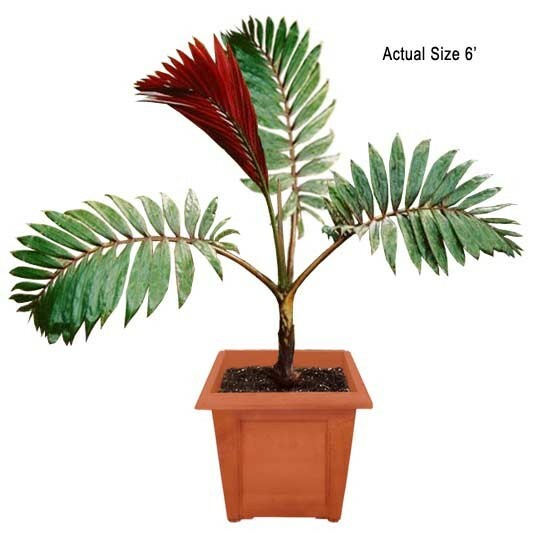 This red leaf palm tree will make a great addition to any home office or landscape. It will give a sense of the tropics with little cost. Its time to go green and buy real palm trees. Palm trees are also great for indoors because they act as a natural humidifier and detoxifier by removing Carbon Monoxide and replacing the air with fresh Oxygen. 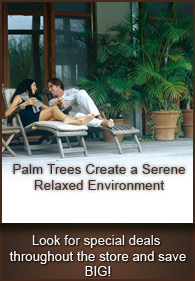 Real Palm Trees make a home feel like home by giving you the feel of nature inside or out. Buy this palm tree and have a piece of unspoiled nature.